Harold has come back from looking for Gemma and Matt, but there was no sign of them, so Madge starts to panic. Harold tries to calm her down but wonders if they might have run off together(!) Madge says that she doesn't think so - all she said was that Matt and Gemma couldn't see each other on school nights. She decides to go and see if Matt has sneaked Gemma into the Mangel place. Joe is on his feet shouting that Kerry is mad for wanting to go off to Northern Australia to count kangaroos - she has kids to look after! Kerry says that she'll take Sky with her, and it'll be a good experience for Sky too. The neighbours will help to look after Toby. Joe isn't impressed, saying that Kerry is indulging in a fantasy. Amber gets involved and tells Joe that he wants to keep Kerry under lock and key. Kerry thinks that Amber has a point, and anyway, it's only for a couple of months - it's her last chance before the baby comes and takes over her life. A knock at the door breaks the flow of shouting, which of course is Madge. She's frantic about Gemma, but Joe and Kerry haven't seen them. Kerry says Matt is very responsible, but Madge says she's going to have to call the police anyway. The police have found Bertha (Matt's car) and Matt and Gemma are simply asleep inside it. The police advise him to take Gemma home - Madge is looking for her. They look at the time and groan. GEMMA: Oh no. We're dead. Madge is pondering whether to ring Tom but Harold advises her to hold off for a while. Matt and Gemma pull up outside the Bishop house. Gemma doesn't know what she'll tell Madge - if she doesn't come up with something good, they'll never see each other again. They have a quick pash and then Gemma goes off to face the music. 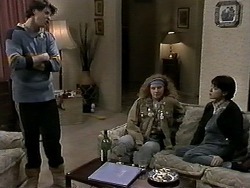 Matt offers to come with her, but Gemma says that Madge will slaughter him. Matt says he doesn't mind, if it will take some of the heat off Gemma. Madge is on the phone to the police who have informed her that Gemma and Matt have been found. Just then, Matt and Gemma come in and Harold starts on them immediately for worrying them so much. This is nothing to Madge's ire though, telling Gemma that she shouldn't have deceived them in the first place. 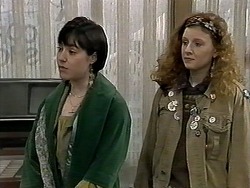 She tells Gemma off for taking advantage of Harold's good nature. She tells Matt to go home - she'll deal with him later. Gemma says it wasn't Matt's fault and nothing like this will happen again. Madge says that Gemma is going to stick to the rules from now on - or else. Joe apologises to Amber for shouting last night - he's worried about Kerry going to the bush in her condition in case something goes wrong with the baby when she's miles from medical help. Amber isn't impressed and tells Joe that he's just being selfish(!) Joe says he doesn't want the baby put at risk, but Amber reckons that Kerry can do whatever she wants. Caroline is off to sort out the Morecambe contract while Paul asks Melanie's opinion on a gift. At first Melanie thinks the gift is for her but Paul explains that she wants her to get it engraved with "C.A". Joe comes in in a very bad mood. But he doesn't want to fight with Kerry - he says it's just Amber putting ideas in her head. Kerry says Amber has just got her thinking - she's realised that there's lots she wanted to do with her life that she hasn't done. Local life isn't enough. KERRY: When I look at all she's done, my life just seems meaningless. JOE:(upset) Meaningless? Looking after Sky and Toby is meaningless? How about our kid? Meaningless? KERRY: I didn't mean that. I don't regret my life with you one bit, honestly. But I just need more. JOE: Oh...I'm sorry. I'm sorry we're not enough. I mean, you are all we need. Kerry starts to cry and Joe storms out. Paul and Caroline are in the spa celebrating their business successes. Christina comes in and is shocked to find them drinking champagne and laughing together. She looks upset. 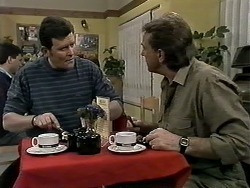 Des and Doug are having lunch. Doug says that work is OK, but he needs a gimmick to make himself more conpetitive. Just then Joe comes in, and Des suggests he and Doug link up - do a package building/landscaping deal. Joe is distracted, but says that he'll be in. DES: Something wrong, mate? Back the wrong horse? JOE: I'm beginning to wonder. Melanie comes round and finds Christina crying. She doesn't want to talk about it, but suddenly pours out that she's jealous of Caroline. He listens to Caroline's business ideas and not hers. Now Paul is toasting Caroline's success and ignoring her. MELANIE: Who cares what he thinks, anyway. CHRISTINA: I do! I love him. CHRISTINA: I know it sounds stupid, but that's the way I feel. I've loved him for so long...the whoel thing's so hopeless. Melanie has made Christina a cup of tea and tells her that it's not a good idea to get involved with Paul anyway - he uses women and tosses them aside. Christina says that Paul was just upset after his marriage broke up, but he's different now. Melanie tells Christina that Paul has bought her a gift - a bracelet (oh no, Melanie!) to say thank you for her work in the gift shop. Christina asks Melanie if she should tell Paul how she feels before he goes to South America. Melanie doesn't think it's a good idea, but Christina is decided and says she'll tell him when he gives her the bracelet. Joe is sitting at the bar very depressed and Harold tells him that Amber is a very bad influence. Gemma is hard at work on her study. Matt calls round with a box of chocolates for Madge to apologise. Madge says it's too late - she's been thinking about the whole business and spoken to Tom, too. They've decided that Matt and Gemma shouldn't see each other anymore. Matt and Gemma are upset. Paul has packed his bags ready to go to South America. Christina sees the bracelet on the side and smiles. Carolines comes in and Paul tells her he has a gift for someone special. He gives her the bracelet. Caroline is very pleased but Christina is devastated.